2f4y.com is only little known and it is ranked #4,320,840 in the english speaking internet. The website is hosted on a Apache web server. It is using HTML 4.01 Transitional as markup language and the loadtime is very fast with an average of 0.34 seconds. 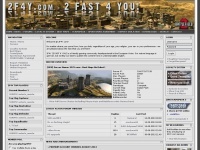 Description 2F4Y.com - 2 Fast 4 You! Gaming Community.